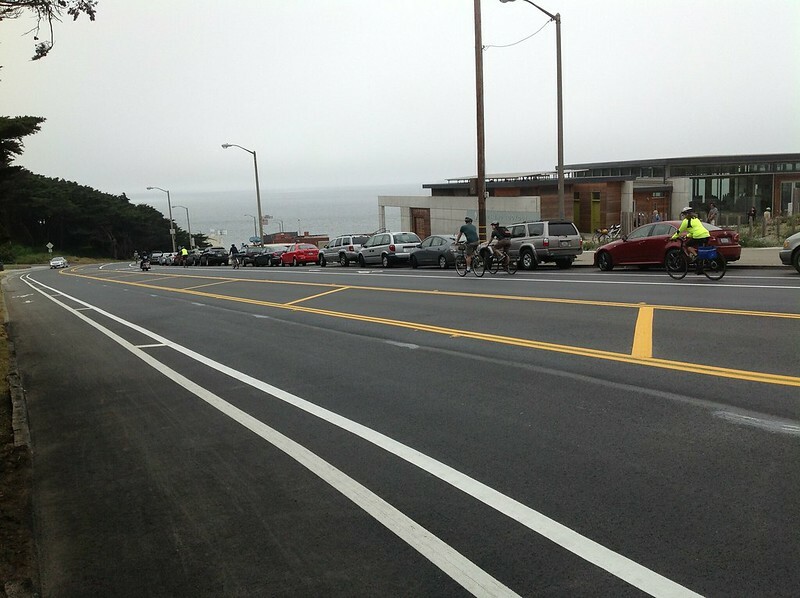 The SFMTA installed bike lanes this weekend on the Great Highway, north of Fulton Street at Golden Gate Park. 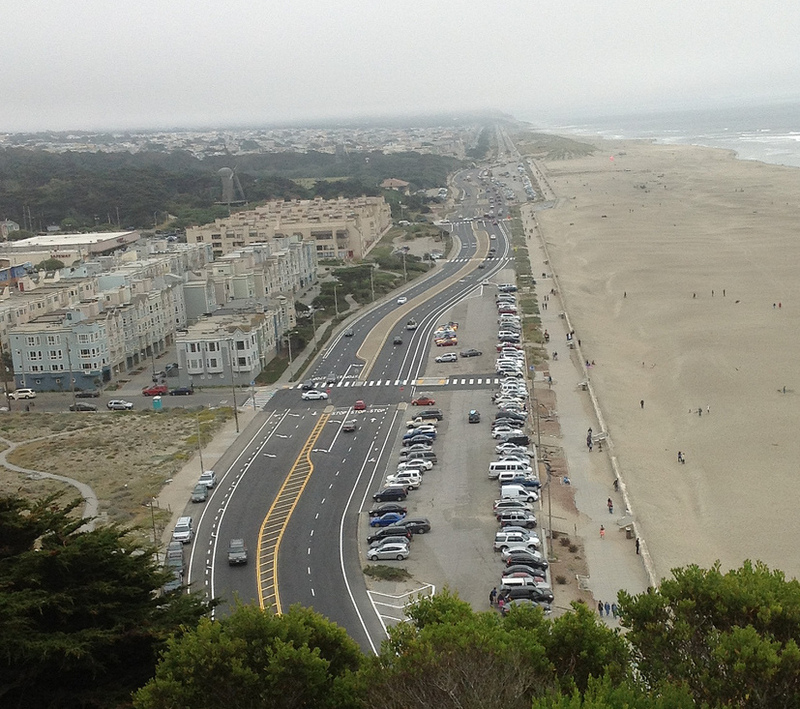 The Great Highway continues as Point Lobos Avenue as it runs by the Cliff House. 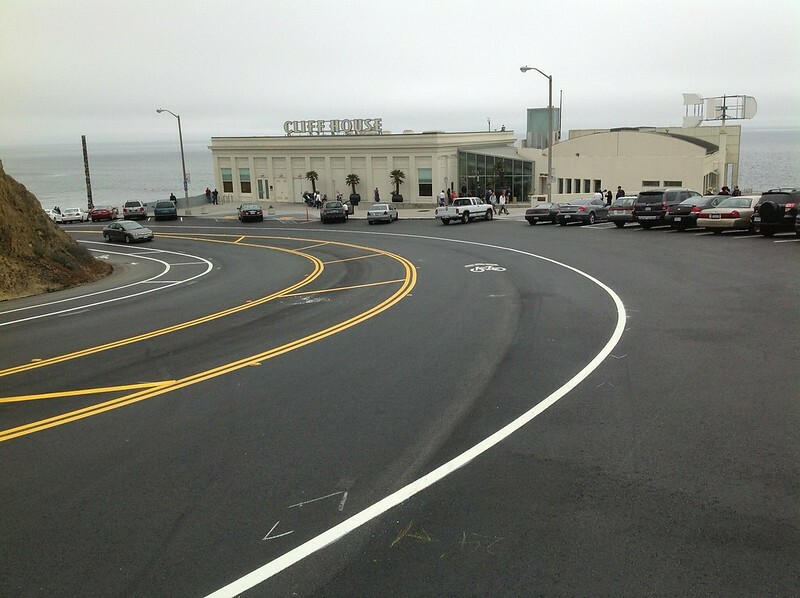 The bike lanes are buffered from motor traffic on some stretches, and two of the four traffic lanes on Point Lobos in front of the Cliff House were removed, which should help calm car traffic. 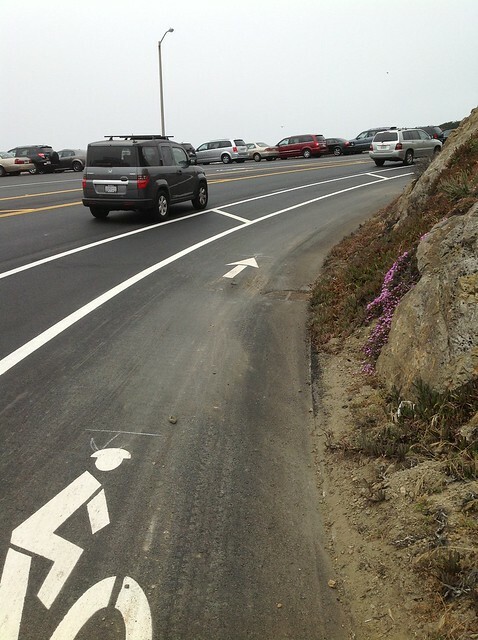 The bike lane also disappears on the downhill section of Point Lobos, though sharrows were stenciled in the traffic lane, and there’s a wide shoulder between the lane and the row of angled car parking which it runs by. The bike lanes were installed as part of a re-paving and streetscape improvement project underway by the Department of Public Works that’s expected to be finished by October. The SFMTA will install plastic posts in the buffer zones “later in the construction period,” according to the agency’s Livable Streets Facebook page. Thanks to Andy Thornley for the photos — he also pointed out that this is part of the Pacific Coast Bicycle Route, which runs all the way from Oregon to Mexico. Looks like a trip to the Cliff House is in order! It’ll be interesting to see if drivers cut into the buffered area or bike lane on the blind curves. If so, hopefully the buffer can be upgraded with a concrete curb. Why is the sfmta continuing to put down bike lanes with neither green paint nor protective posts? Is this part of an immutable plan or is there room to modify it? Anyone know? I just don’t get why bikes have to share road with cars going downhill. Going downhill could be just as dangerous as going flat or up. What if a car is driving too close when the cyclist falls over at a faster clip, what do you think it would happen afterward? This will never get 8-80 to ride. What a shame! Another bike lane gets the dust (see last photo). would have liked protected lanes from the get-go, but we’ll take paint for starters. The SFMTA will install plastic posts in the buffer zones “later in the construction period,” according to the agency’s Livable Streets Facebook page. Thank the baby Jebus. I used to take the uphill in the lane, but had one too many instances of cars whipping around the corner at speed that for the last few years I have taken to using the extra wide sidewalk across the street. I know it is technically “illegal” but it beats the hell out of getting killed. Unless there are at least regularly replaced soft-hit posts, you can bet this will be cut into by the cars. Look at the wear on the buffer zone where JFK peals off of Kezar Drive if you have any doubts. Thanks for the improvement SFMTA. Because going downhill you are going faster and need more of the road to maneuver your turn. A barricaded lane would be a big problem, at speed you can’t make a turn in such a small slot. I have gone down Clipper many times and have yet to touch the bike lane. I need the whole lane. And that’s perfectly reasonable as I’d be going the speed limit. This downhill corner is part of Escape from Alcatraz. That ought to be interesting. EFA used the 2 center lanes. Trying to do so again would leave no room for cars. My advice is to get out and ride on it once or twice and see what you think about the quality of the bike space, and then ponder how to get it closer to 8-to-80 grade for biking. SFMTA & DPW have done a swell job with the materials and conditions they had to work with, there may be more awesome ways to set it out, but the bicycling environment on this roadway has gone from D to B+ or better (confident bike riders will grade it higher, I think, and be grateful for the perfect pavement as much as for the stripes). Having ridden it a couple of times I’m very pleased, the buffered bike lane and smooth pavement makes the northbound trip much more mellow — pedaling uphill may not be any flatter, but it’s a lot more pleasant. 8-to-80? With that incline the road will always be somewhat challenging for bicycle traffic, but a reasonably fit adult can make it up the hill and the bike space is pretty good (it had been nerve-wracking/terrifying). When I was pedaling up the grade from Safeway with a basket full of groceries, a couple of kitted-out roadie dudes steamed up behind me and had no trouble passing, thanks to the wide bike lane and buffer. SFMTA will be adding plastic bollards as they generally do in bike lane buffers these days, I’d like to see those bollards nearer to the travel lane than to the bike lane (so those roadies can keep passing me in comfort). Southbound downhill past Louis’ and the Cliff House the bike lane does drop and there’s a single shared travel lane and a wide shoulder, for me it felt more natural to ride in the wide shoulder (braking and alert to taillights) than bobsledding out in the travel lane (with sharrows in it), but then I’m a guy with a basket full of groceries. Of course that wide shoulder has the back ends of cars parked diagonally; generally it’s best not to bring bike traffic too close to the back ends of parked cars (and the parking in front of the Cliff House really can’t be removed at this point in California history, check back later), hence the sharrows in the travel lane. This is actually less 8-to-80 than the uphill experience and parents may still be taking their kids (and adult tourists taking themselves) downhill via the sidewalk, but with that steep winding grade up and down it’s never going to be JFK Drive or the Yosemite Valley loop. Still, it’s pretty good, go out and ride on it and see what you think, and bring a camera so you can be ready to catch a million-dollar sunset photo, pinky orangey scarlet sky backdropping a beautiful international bikeway in our backyard . . .
It’s a bit late in the day to offer design suggestions, but–looking at the top picture there– wouldn’t it have been nice to slide the entire parking lot a few feet to the left (east) and have the bike lane continue straight along the shore, fully protected? The road warriors will take the road anyway, as they don’t need a bike lane, while the 8-80 crowd would probably appreciate the greater separation. But I nit-pick. I’ve gone down once already, and it’s really great. I could be mistaken but it looks like the median could be narrowed and the traffic lanes in general be narrowed to accommodate buffered/protected bike lanes in each direction. You had me at “perfect pavement”. You have a good point but I still think it should be buffered not barricaded. Or make the bike lane wider. I just pictured myself going downhill at the age of 60 and I definitely don’t want a car behind me. Downhill part is challenging because people will bike at different speeds and that not all the bikes have the same braking ability (not really an issue on the uphill part). Cyclists needs room to maneuver to compensate for the inconsistent braking ability. Secondly, there’s need for room in the parking area for drivers to stop and wait for other cars to back out. I don’t think it is a good idea to mix faster moving bike traffic with stopped car traffic waiting for a parking space. Expensive cancer meds would save my life but I only get the cheaper ones… better than nothing. The Portola Drive bike lanes have the same issue, dropping out and turning into sharrows for the last half mile westbound, downhill. In general, SFMTA is a little too comfortable using sharrows on downhill segments of very high speed roadways, in the belief that it’s safer than risking a dooring. 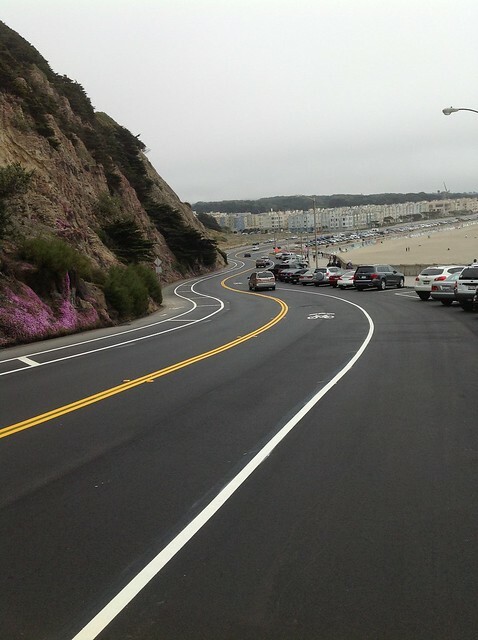 While downhill dooring is a very real issue, the better solution is to do a buffered bike lane where possible, which certainly includes Portola, if not the Great Highway just yet.